SEOUL, Nov. 29 (Yonhap) — Three South Korean football clubs will learn their fate in the country’s top pro football league this weekend as they enter their final relegation battle. FC Seoul, Incheon United and Sangju Sangmu are hoping to avoid relegation after playing their final match of the 2018 K League 1 season on Saturday. Heading into the season finale, many things have already been determined in the K League 1. 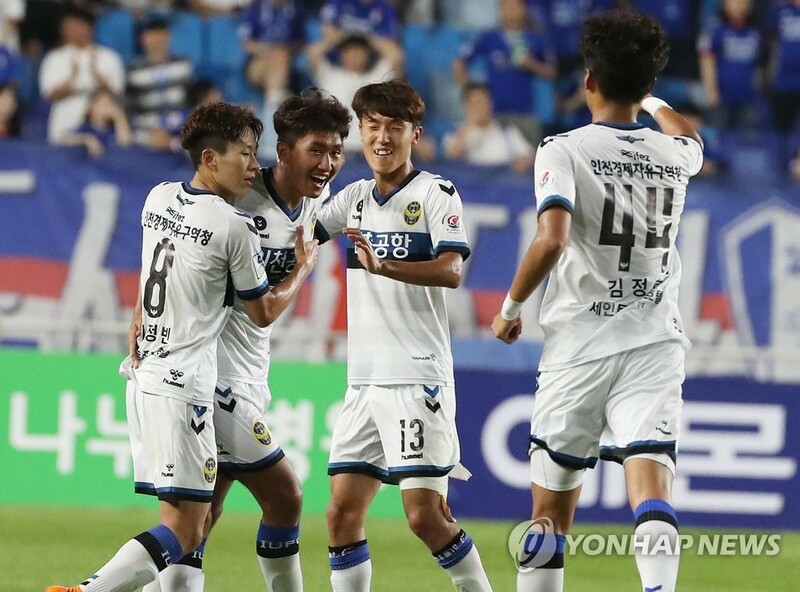 With Jeonbuk Hyundai Motors declared league champions, newly promoted side Gyeongnam FC and Ulsan Hyundai FC took second and third place, respectively, in Group A, or the upper group, and secured their spots at the 2019 Asian Football Confederation (AFC) Champions League. The K League 1 is operated under the split system, in which 12 clubs are divided into two echelons after playing 33 matches. In Group B, or the lower group, Jeonnam Dragons were confirmed as the bottom team and will be demoted to the second-tier K League 2. The battle to avoid one remaining spot in the relegation zone is not done yet. The K League has been using a promotion and relegation system since 2013. Each season, the last-place club in the K League 1 gets relegated directly to the second division the following season, while the second-to-last team must survive the promotion playoff series against the K League 2 playoff winners in order to remain in the first division. To avoid 11th place and a cumbersome playoff, Seoul, Incheon and Sangju are determined to give their all in their 38th match of the 2018 K League 1 season. Sangju are currently in 11th place with 37 points, two points behind No. 10 Incheon and three points less than No. 9 Seoul. The relegation battle will mainly come down to the match between Sangju and Seoul at Sangju Civic Stadium in Sangju, North Gyeongsang Province. Seoul need at least a draw to avoid 11th place, but Sangju, a military football club, must collect a win to escape relegation. If Sangju beat Seoul, both teams will have 40 points, but the former will hold a tiebreaker edge in goals scored. Both clubs have so far scored 40 goals this season. Seoul, led by head coach Choi Yong-soo, collected one win and two draws against Sangju in the K League 1 this season. The six-time K League 1 champions have not experienced relegation in their club history. Sangju are familiar with this situation. Last season, they survived in the promotion-relegation playoff against Busan IPark FC and remained in the K League 1. For Incheon, a draw against league-worst Jeonnam will be enough to secure their spot in the K League 1 next season. If they collect a draw, Incheon will have 40 points, and even if Sangju defeat Seoul, Jorn Andersen’s side are likely to take ninth place with the better goals scored record. Incheon have so far netted 52 goals this season. Incheon are considered favorites to survive in this relegation battle as they are on a three-game winning streak, while Jeonnam are on a five-game losing streak. But if they lose to Jeonnam and Sangju beat Seoul, Incheon will end up in 11th place and will enter the playoff series against a K League 2 club.